Lurking in the bargain bins of game shops is a surprisingly well-built keyboard. 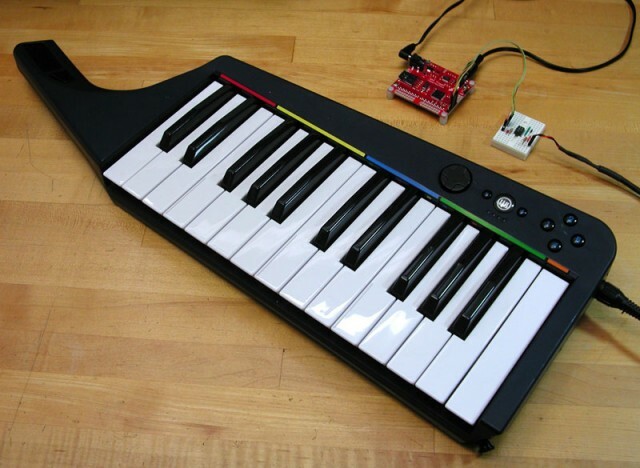 The Rock Band “keytar” controller may have been made for games, but the keybed is solid, the thing is light, and it can run on batteries. So why not turn it into a standalone instrument? That’s what Jamie Robertson has done with his, and he shows you how. The magic here is something he calls the WAV Trigger. Without naming any names, while there are a lot of cool Arduino shields and the like out there, a lot of them are pretty functionally limited. They’re cool to play with, you can build some fun projects, and they can teach you a lot — but the WAV Trigger is something different. It’s built to play 14 tracks of uncompressed audio at once, with enough control that it becomes a viable, 14-voice, polyphonic sample playback instrument. MIDI is built in, and trigger latency is low (around 8 msec). It’s also a bargain – under US$50.